Bugs very well could be the future of food: René Redzepi already serves ants at Noma. Beyond fine dining, though, they’re seen as an underutilized, yet completely viable food source that could become more vital as our natural resources continue to be stretched. Plus: Nutritionists have long been impressed with the protein-delivery capabilities of insects (a serving of grasshoppers packs about as much as chicken or beef but with less fat and more calcium). But it’s not like insect-eating is some new concept. 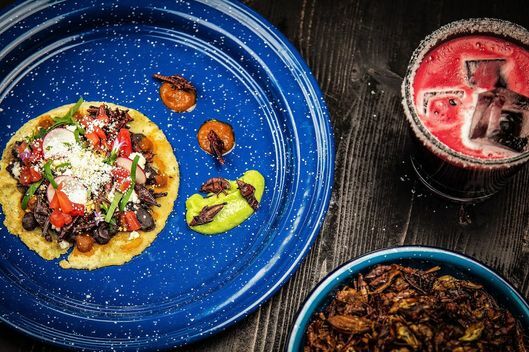 In fact snacks of toasted grasshoppers and toasted-ant moles are deeply proud traditions in the Oaxaca region of Mexico, and plenty of other cultures around the globe eat things like waterbugs and black-clawed scorpions. Now, it seems, more and more New York restaurants are catching on, too. Here are seven spots offering cuisine that’s truly worthy of the Grub Street name.